Visiting the Algarve for New Year’s Eve? While the parties may not be as big as those in Lisbon or Porto, there is plenty happening across the whole of the Algarve. From black-tie dinners in Porches to all-night parties in Albufeira and Armação de Pêra, there’s something to suit every taste. It’s a good time of the year to visit the Algarve as well. Although New Year’s Eve is a lot livelier than the rest of winter (and in particular, Christmas a few days before) it’s still a fairly quiet time of the year to visit. This has its pros and cons: while you won’t have to queue for a table at most restaurants, there’s also the chance that the restaurant you’re thinking of going to will have closed up for the winter. Of course, many places will make a special effort to be open for New Year’s Eve. Food is an important part of the New Year’s Eve celebrations for most Portuguese people, if not the most important part. Most New Year’s Eve events will include a dinner of at least three courses, but usually a lot more than that. Then there are the 12 raisins (one for each month of the year), which are eaten at the midnight countdown and washed down with a glass of champagne. Bolo-Rei, a popular fruit cake that’s covered in candied fruits, is usually also eaten on New Year’s Eve. There’s usually one fave (broad bean) inside each Bolo-Rei, and whoever gets the slice with the bean is supposed to pay for the cake the following year. As it’s a popular time of year to eat out, it’s definitely recommended that you book beforehand. In fact, you’re probably not going to get into most restaurants unless you have a reservation. Weather-wise, it’s usually fairly pleasant with some winter sun during the day and then cold at night. Expect average daily temperatures of around 12-13°C during the day, which is usually pleasant to walk around with just a light jumper or coat on. 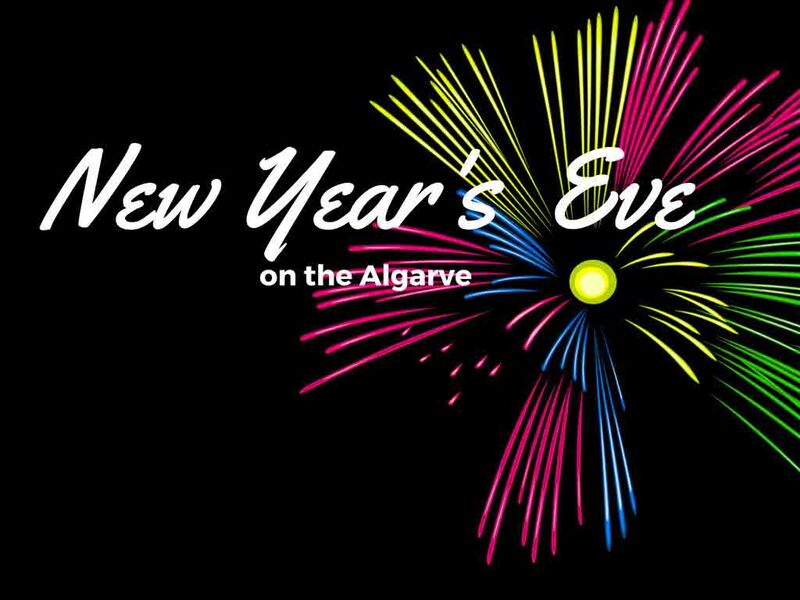 The following are just a few of the events that are taking place across the Algarve on NYE. For the biggest and liveliest NYE option, Albufeira is the place to be. Unlike the rest of the Algarve, which can be fairly quiet around Christmas, Albufeira usually stays buzzing with activity. And, on NYE there’s even more activity than usual as thousands of people from across the Algarve, Portugal, and even further afield come to celebrate NYE here. Expect between 50,000 – 80,000 people at the fireworks display on Praia dos Pescadores (Fishermen’s Beach). Afterward, the bars and clubs stay open until the early hours of the morning. Another party-destination, Armação de Pêra will have live music on Praia dos Pescadores (Fishermen’s Beach) until midnight when there will be a firework’s display. After that, there will be live music (DJ) until around 3 am. Along with most of the other towns in the Algarve, Lagos also hosts its own fireworks display which you can watch from the Marina. Bring your own bubbly and join in the fun! This is more low-key than the events in Albufeira, but there’s always still enough people to create a very enjoyable atmosphere. New Year’s Eve in Portimão is always a lively event with fireworks, entertainment, and food stalls along the river front. In the hours leading up to the midnight fireworks there’s live music along Zona Ribeirinha de Portimão, and then the party usually continues in the nightclubs around Praia da Rocha and Alvor. Live music from 22:30 in Praça do Mar, followed by fireworks at midnight. As with all of the other major towns and cities on the Algarve, Faro always has its own New Year’s Eve party. Live music starts at 10pm, with a brief pause for the fireworks piromusic show, followed by a DJ and more partying. Black-tie 6-course dinner & Vegas-themed ball: Vila Vita resort in Porches are holding a Vegas-themed ball and dinner. This will take place between 7 pm and 12 pm, followed by fireworks and then a disco and late night buffet. Tickets cost €250 for non-guests (accommodation not included – book @ booking.com). Gala, Dinner & Dance at the Holiday Inn: Every year the Algarve Holiday Inn hosts its annual New Year’s Eve party. This year, their €270 pps package includes 2 night’s accommodation, afternoon tea, dinner, gala, dancing, buffet breakfasts, and a hangover brunch. “Casino Royal” Party at the Conrad Hotel: This year the Conrad Hotel in Quinta-do-Lago are running an 8-course menu at their Gusto Restaurant. Alternatively, there’s also a New Year’s Eve Casino Royal ball and 5-course dinner. Both options include a bottle of Laurent-Perrier champagne and cost €275 and €295 respectively (accommodation not included – book @ booking.com). “Great Gatsby” Party at the Pine Cliffs (formerly Sheraton) Hotel: The Pine Cliffs in Albufeira are breaking in the New Year with a Great Gatsby party that includes a glamorous dinner, entertainment, fireworks, and an after-party that’ll run into the early hours of the morning. Have you spent New Year in the Algarve? Let us know what you thought by leaving a comment below.